Do you know that you do not need to insert an audio CD into your computer each time you want to listen to it? This is because you can copy the contents onto the MAC's hard drive and then forget about the CD if you like. Method : Insert an audio CD you want to copy into your computer. Open iTunes. iTunes will start querying the database. Once the database query is complete, a pop up will ask you to select the CD from drop down. 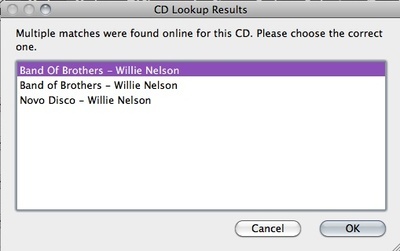 Select your CD and click on 'OK'. Next pop up window will ask if you would like to import the CD. Click on 'YES'. Once the CD is imported, the final screen will look like the image below. Alternatively you can select songs and hit on Import CD button at the bottom right corner of the Window. A green check mark indicates the songs have been copied. Now you can eject the CD. The songs are stored in iTunes Library.